Juan Estwick knows firsthand the heartbreak of being separated from her children. In 2002, she left her 6-year-old and 7-year-old daughters behind in Barbados to come to New York and work as a nanny. It would be a decade before she and her own children could live together as a family, again. "It was heart-wrenching. I remember what it was like living without my kids," Estwick said. "It was hurtful. Even though my kids were living with their family, a mother's love, a parent's love, is like no other." The pain of that separation -- while voluntary -- has never left Estwick. It's why on Wednesday, the 47-year-old joined dozens of other nannies, parents, and children outside the federal building in Manhattan where U.S. Immigration and Customs Enforcement (ICE) has offices to protest the Trump administration's separation and detention of immigrant children and families. Children held a mock trial in front of the entrance to the building, while protesters chanted and held signs calling for the immediate release and reunification of all detained immigrant children. 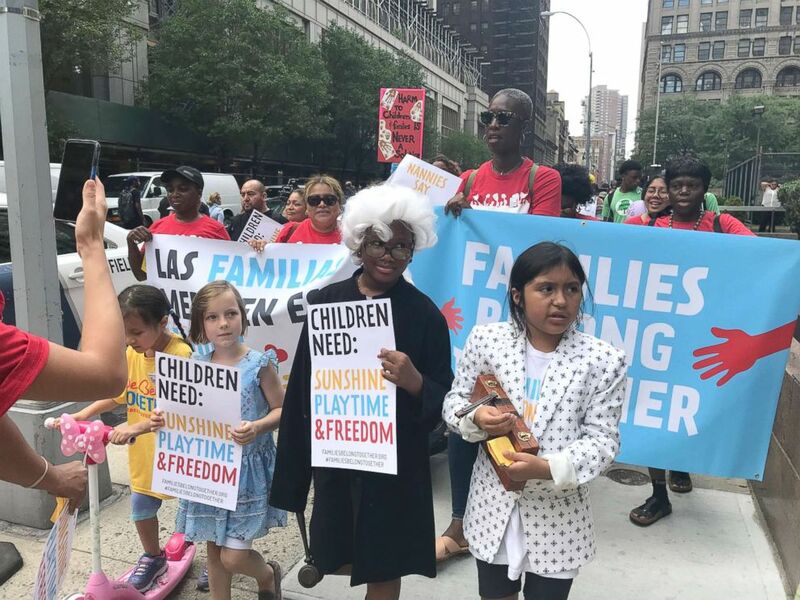 Children, parents and nannies protested family separation and child detention policies outside the offices of ICE in New York on July 18, 2018. 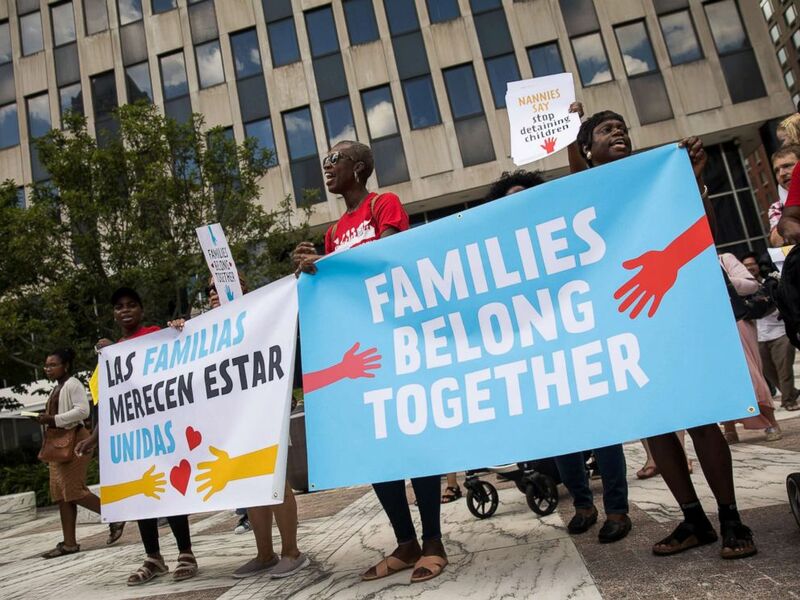 The administration has said it's working to reunite immigrant children who have been taken from their parents at the border, but that process has been criticized as slow and incomplete by some immigrants rights groups and the American Civil Liberties Union. In late June, a federal judge in California set a 14-day deadline to reunite children under the age of 5 with their parents and a 30-day deadline for older children, the Associated Press reported. But the government did not completely meet the deadline of reuniting all of the young children under 5 years old covered by the court order. The deadline for reuniting older children is quickly approaching. In the meantime, children have described cold rooms, smelly food, dirty toilets and cages crammed with young children at various facilities to volunteer lawyers, interpreters and other legal workers who interviewed them and filed a report in federal court in Los Angeles this week, according to the Associated Press. You think about taking a child to preschool, and the heartbreaking cry when they're separated just for a couple hours. Then you think about these 3-year-old children, 5-year-old children, at a detention center, and them not knowing when they are going to see their parents again. On Wednesday, protesters also took to the streets in Miramar, Florida, where several people were arrested after appearing to form a human chain to block traffic, ABC affiliate WPLG reported. More protests by nannies, childcare workers, parents, and teachers are planned for cities across the country over the next several days, organizers from the National Domestic Workers Alliance said. "It is personal to me. First of all, I'm an immigrant," Estwick said. "I was also living without my children, so I know how it feels. My children were not taken from me, I made a choice, so I can't imagine how these parents feel to have their children taken." 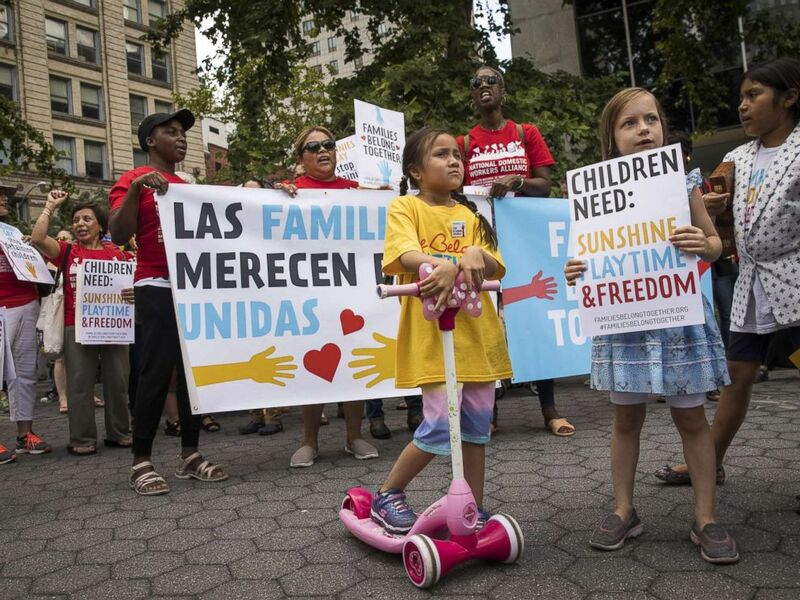 Activists, including childcare providers, parents and their children, protest against the recent family detention and separation policies for migrants near the offices of Immigration and Customs Enforcement (ICE), July 18, 2018 in New York City. After saying it had ended its policy of separating families at the border, Trump administration officials are working on plans on how to detain families together, including at military bases, something Estwick said she also believes is unacceptable. "When you talk about detaining children in a detention center, it has a long-term, traumatic effect," Estwick said. "It makes them sad, it makes them not able to express themselves. Children should be with their parents, children should be with their friends, being able to eat, being able to interact. Children should not be detained. It's inhumane and cold and we won't stop until something is done." ICE did not immediately respond to ABC News' request for comment about the protest. Angela protested alongside her employer and the little boy she now takes care of, who is close to the age of Angela's daughter when she left her with her mother in Ecuador to come to New York. Angela asked us not to use her last name because of her immigration status. In 2000, Angela left her four children behind to come to the U.S. on a tourist visa, which she overstayed so she could work as a nanny. Angela said she never thought it would be 13 years before she saw her daughter again. "When I saw her she was big, a teenager. It's different, it's not like when your kids just stay with mommy every day. It's like a stranger. I went to hug her, and she said, 'Hi, mom,' but it's different," Angela told ABC News. "I'm only working here. I feel very sad about that because I want my kids to be with me but it's not possible." Four families and 18 years later, she's still here in New York, now in the process of applying for a green card. But Angela said she knows how her absence affected her relationship with her own kids, especially her daughter. "My mom is her mom. I understand, she's been with my mom -- every day, she makes her dinner, lunch, breakfast. She's with her when she's sick," Angela said. "I was coming here because I didn't have a job in my country." Angela said she felt moved to act after seeing photos of some of the more than 2,000 children in immigration detention facilities at the border this spring. She also took two days off to travel to Washington, D.C., to participate in massive demonstrations against family separation on June 30. "I'm an immigrant," Angela said. "The kids sleeping on the floor, who don't have a bed -- I cried every day when I saw the news because I'm also a mother. I feel very bad, the kids crying, not eating well. When the kids aren't happy, nothing is happy." Jacqui Ori, a nanny and a groundbreaker with the National Domestic Workers Alliance, said nannies are in a unique position to speak out because of their experience. "You think about taking a child to preschool, and the heartbreaking cry when they're separated just for a couple hours," Ori told ABC News. "Then you think about these 3-year-old children, 5-year-old children, at a detention center, them not knowing when they are going to see their parents, again. We as professional nannies, we know what it is to care for children. We know what they need emotionally." Regardless, if they're an immigrant or a United States citizen, it really has no bearing on the love that they have for their children. "To detain a child, taking them from someone they have known all of their short life, taking them away from their parents and putting them in a place where they are not free anymore, they're behind bars, is not healthy for a child," Ori said. Parents also protested in New York on Wednesday, many of them pushing strollers or carrying infants. Kurt Bonz, 48, protested with his 2-year-old son. "Being a parent is new to me," Bonz told ABC News. "But I think it's really just important because understanding the love I have for my child is no different than the love someone else has for their child. Regardless, if they're an immigrant or a United States citizen, it really has no bearing on the love that they have for their children. Being pulled away and ripped away from their family, from their children, is disgusting. I don't think that's representative of my values or American values." He went on to add that it's time for people "to stand up and say this is not who we are" as a nation. Rosa Squillacote and her wife, Sarah Mills, also came to protest with their two newborn children. "As new parents, we have been totally horrified by the stories of what has been happening at the border and how we are treating immigrants and people seeking safety," Squillacote told ABC News. "Any human being should be treated with dignity and respect and not warehoused and detained for absolutely no reason." But especially for women like Angela and Estwick, who have felt the pain of -- in their cases, willingly -- having to leave their children behind, it's crucial to speak out now. “The love I wasn't able to give my kids, I gave to other people's kids. So I am going to continue to reinforce this: These children need to be with their parents," Estwick said. "It is not OK. I don't care what any administration says, they are not happy and they are not being taken care of. And it needs to stop."